Vermont has long been known as a charming area to visit, and it is a very popular tourist destination on the east coast. In fact, many first-time visitors are surprised at how picture perfect Vermont really is. With stunning scenery and a seemingly infinite number of charming towns, the state is definitely a welcoming oasis for travelers either passing through or on a road trip to hunt down the famous local goods such as maple syrup and, of course, everyone’s favorite, Ben and Jerry’s ice cream. However, Vermont is so much more than its sweet offerings. 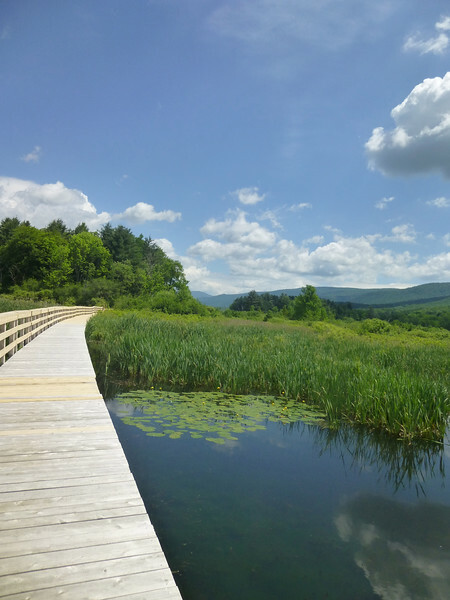 In fact, when guest contributor, Teresa Otto from The Nomad’s Daughter, found herself stopping in Vermont on her way to Maine, she was surprised to find so many things to do and see. She’s here today to tell us all about exploring Hildene, just one of Vermont’s many charming towns. When you travel with a group, compromise is a must. I am more of an outdoorsy traveler and was itching to get to northern Maine to photograph a moose. But my traveling companions wanted to explore southern Vermont first. Thanks to them, we found a gem of many facets – a handsome mansion and Lincoln exhibit, showy gardens and woodland walking trails, a fully restored Pullman sleeper rail car and a dairy farm with busy kid goats. Truly there was something for all of us at Hildene. Hildene is known for its long history, but often shocks visitors with its pristine beauty. Hildene is nestled between the Green and Taconic Mountains near Manchester Vermont. The mansion is the fully restored Georgian Revival summer home of Robert Lincoln, Abraham and Mary Lincoln’s only son to survive to adulthood. Robert built the home in 1905 and for the next 70 years his descendants lived here. In 1978, a non-profit group, The Friends of Hildene, purchased the home. 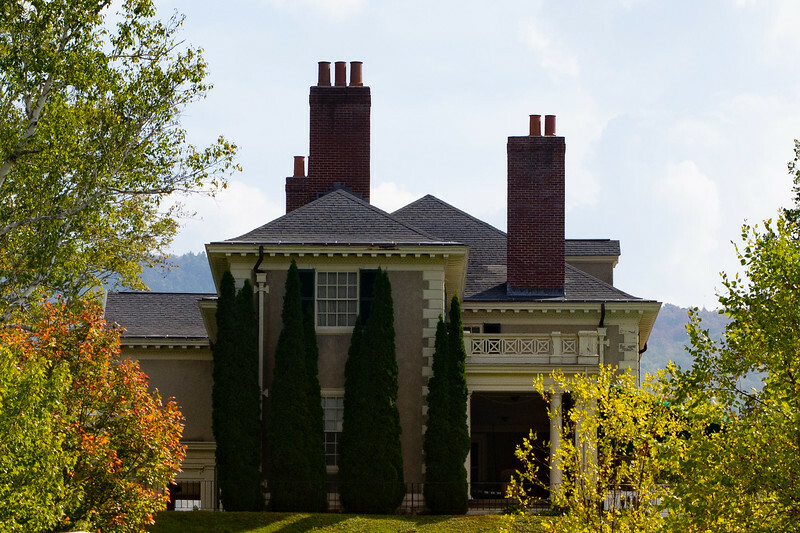 After years of restoration, Hildene opened its doors to visitors. If you go: Hildene is located at 1005 Hildene Road, Manchester, Vermont. It is open daily from 9:30 to 4:30 (closed Thanksgiving, December 24-26, and Easter). See their website and calendar of events for details. Tours of Hildene begin with an introductory video at the former carriage house turned Welcome Center. Continuing to the mansion, music from the thousand pipe Aeolian organ greets you. The self-playing organ was Robert’s gift to his wife, Mary. Hildene is furnished with original furniture – from the simple bed, dresser, and steamer trunk in the butler’s quarters to the ornately carved four-poster bed, Persian carpet, and bureau in a guest bedroom. In all 24 rooms on display, you’ll see attention was paid to every detail. One of the many fresh flower displays made by volunteers. 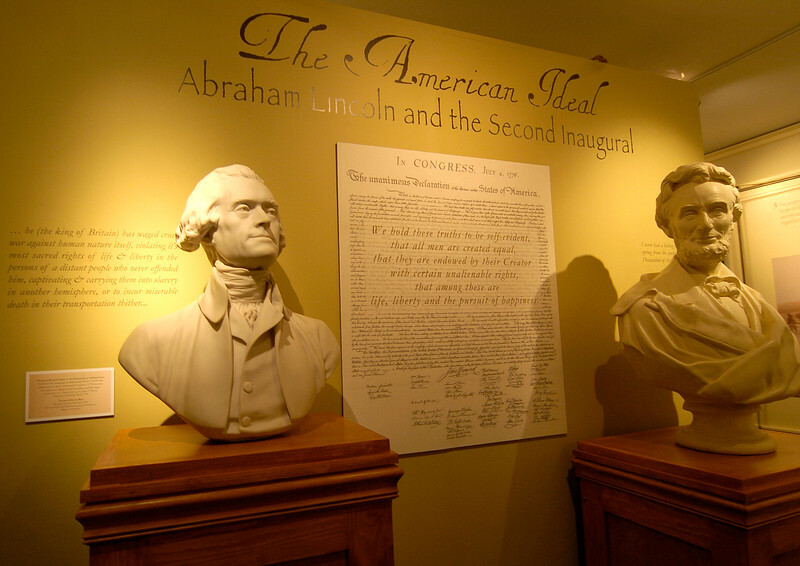 Upstairs, besides the family bedrooms, you’ll find the exhibit, “The American Ideal: Abraham Lincoln and the Second Inaugural.” It contains original documents signed by President Lincoln along with one of his stovepipe hats. With only three of his hats left today, it is a treasure. Take the time to read the placards next to items on display. One label next to a dressing mirror in the museum states, “Imagine Lincoln looked into this mirror prior to leaving for Ford’s theater the night of his assassination.” Remember to look up, too. President Lincoln’s second inaugural address, stressing forgiveness and unity at the war’s end, is printed on the walls above the displays. It is a moving, thought-provoking exhibit. For some, the visit ends at the historic mansion. However, taking time to enjoy the grounds is a must. 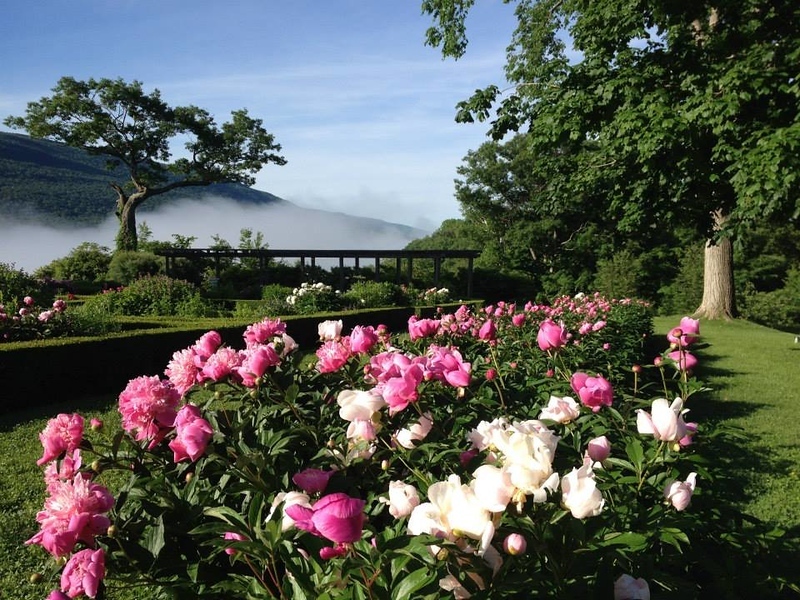 Each May and June, Hildene hosts the Celebration of the Peonies. 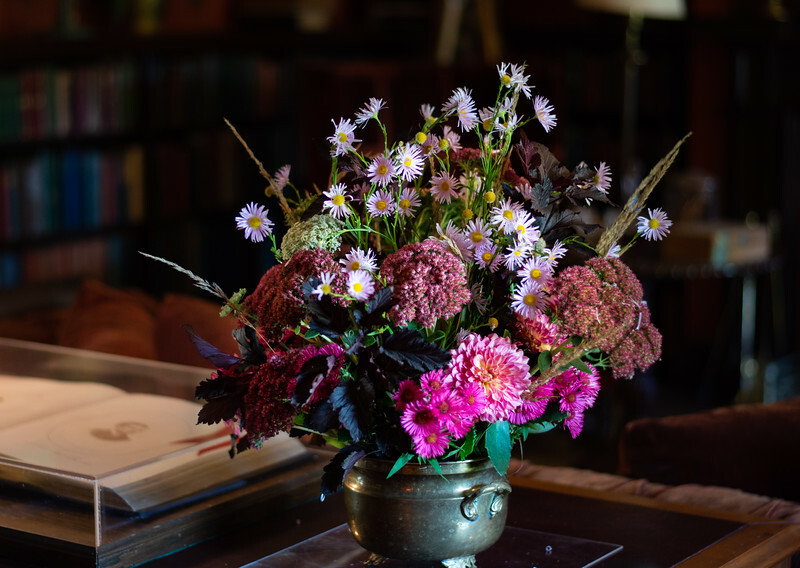 Hildene’s famous peony garden – a formal garden patterned after a stained glass window – explodes with the pinks of frilly peonies and the oranges of showy Monarch butterflies. Robert and Mary’s daughter, Jessie, planted more than a thousand peonies here in 1907. Two of Jessie’s unique, dinner plate-sized peonies, the Hildene and the Jessie Lincoln, are registered with the American Peony Society. Looking for some help in planning your Vermont adventure? Start your search for hotels in Hildene with us! If you can’t make the Celebration of the Peonies, you’ll still see magnificent gardens. By design, Hildene’s gardens, meadows, marsh and woodlands are a pollinator sanctuary. As such, Ms. Luchini ensures flowers bloom throughout the growing season. To specifically help the declining butterfly populations, gardeners cultivate milkweed for Monarchs, dill for Eastern Black Swallowtails and mallow for Painted Ladies – all plants that are crucial for their survival. Farther afield, I encourage you to trek out to the dairy goat farm and cheese-making facility by way of a trail from the Welcome Center or shuttle. 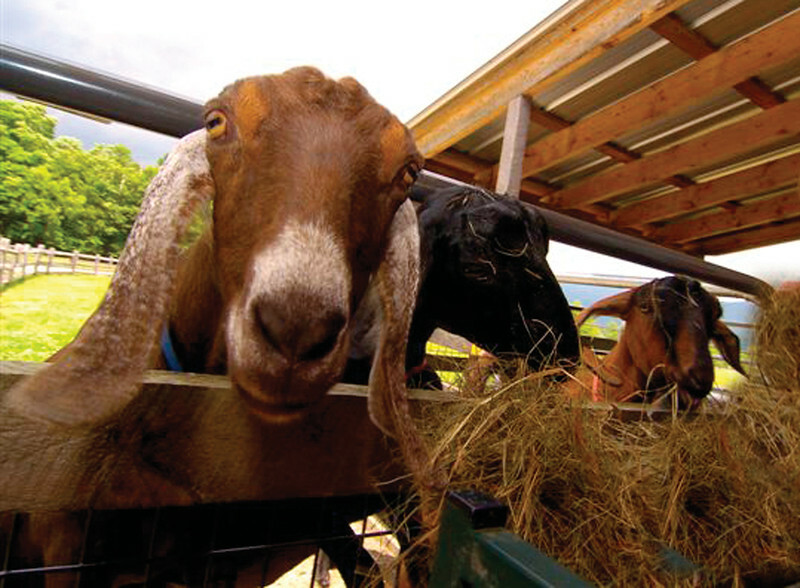 Take a few minutes to pet the goats before heading to the cheese-making building. Nubian goats are friendly, good-natured and eager for attention. Once inside the environmentally-friendly building, a volunteer takes you through the process of making chevre, a fresh goat milk cheese and tomme, an aged goat or cow’s milk cheese. In total, Hildene makes four cheese varieties which are for sale in the gift shop. 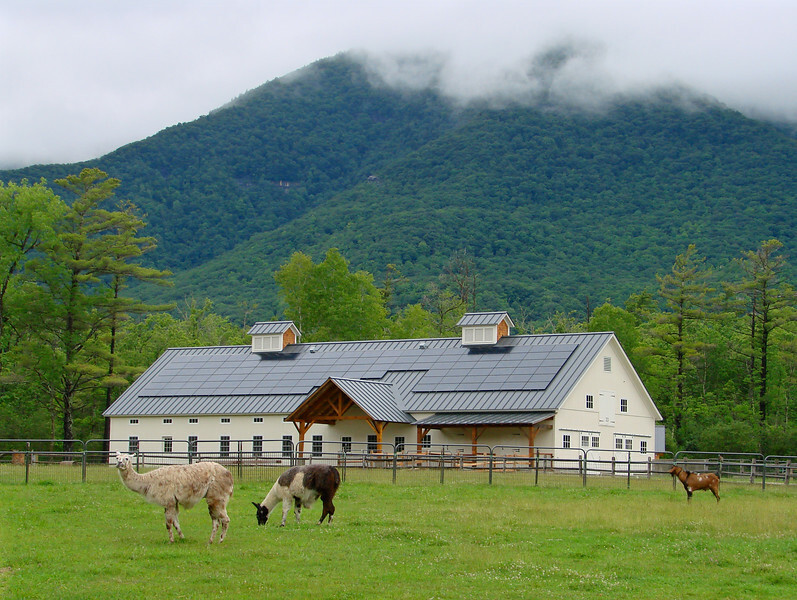 Hildene’s second farm, the Dene, is home to cows, sheep, alpacas, pigs, rabbits and chickens, as well as a greenhouse and apiary. Protected areas here are kept wild as a reserve for bees, beneficial insects and birds. Dene farm focuses on sustainable farming and educating the next generation, as well as each of its visitors. The Battenkill River and marshland run adjacent to Dene farm. Here you’ll find a floating wooden platform that allows you to get closer to the red-winged blackbirds, blue herons, beavers, muskrat, and turtles that call the marsh home. It’s an ideal, easily accessible bird-watching spot. The final must-see is Sunbeam, an impeccably restored Pullman Palace sleeper car, accessible by trail or shuttle from the Welcome Center. 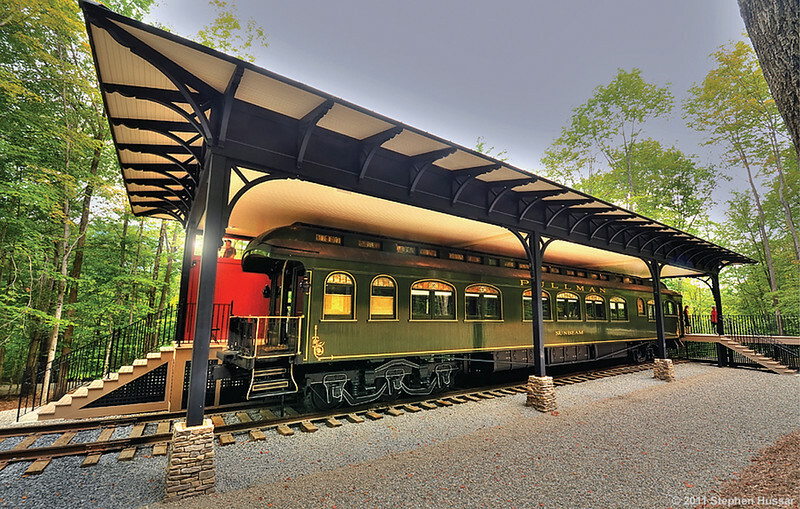 This handsome, wood-paneled rail car is a nod to Robert’s career as president and later chairman of the Pullman Palace Car Company from 1897 to 1924. The car serves as a backdrop to the “Many Voices” exhibit. The exhibit spans the hundred years between the Emancipation Proclamation and the Civil Rights Movement. It focuses on the newly-freed slaves employed as Pullman porters, the well-healed passengers they served, and the managers whose policies allowed the porters to be overworked and underpaid. Hildene encourages visitors to write their civil comments on a chalkboard after exiting the train. 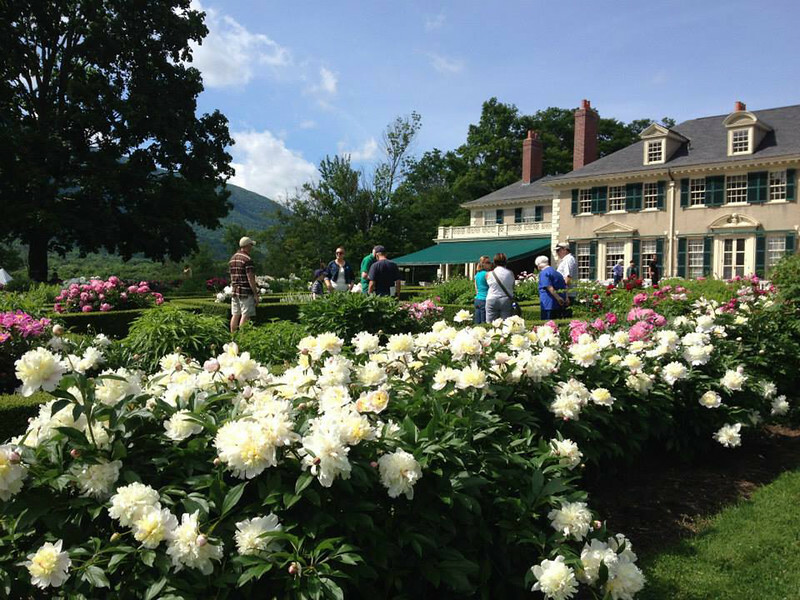 Depending on your interests, a visit to Hildene can take anywhere from three hours for a mansion and garden tour to six-plus hours for a full tour of the estate with some walking. It promises to be a day filled with history, discovery, and fresh air – with a little something for everyone. For us, it was the highlight of our trip. For more active pursuits around Manchester, hiking/biking spots include a five mile round trip moderate hike to Lye Brook Falls or any number of hiking/mountain biking trails in the Equinox Preservation Trust. The Battenkill River is known for its challenging flyfishing. Winter brings snowshoeing and cross-country skiing on Hildene’s trails with gear you can rent there. For dining, I recommend having a light lunch at one of the picnic tables by the mansion with Hildene cheese, crackers and drinks you can pick up at the gift shop. After your day touring, splurge for a meal at the Silver Fork. It’s on the pricey side, but you’ll enjoy the local offerings and intimate feel of the restaurant. It opens at 5 pm. With only six tables, reservations are a good idea. For accommodations, The Reluctant Panther Inn is a cozy boutique hotel with twenty rooms – each with unique décor. Rooms start at about $160. Hildene, Vermont is definitely a wonderful place to stop over on a north-east road trip. Even better? Why not take a long weekend to explore this charming little town? Teresa Otto is a freelance writer, photographer and retired pediatric anesthesiologist. After growing up in Montana, she has lived in Washington, New York, Kentucky, Hawaii, Germany, and Kuwait. While she intends to see much of the world while traveling off the beaten path (and plans to go back to Maine in search of the elusive moose), Montana will always be home. Keep up with her travels at The Nomad's Daughter, and on Instagram.